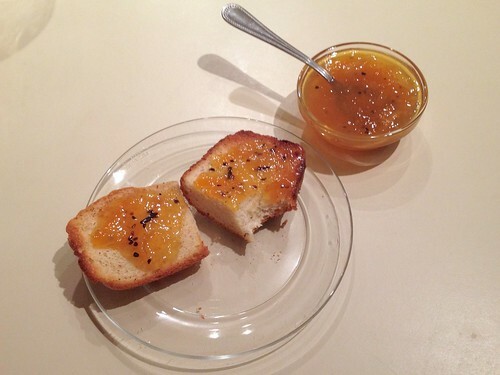 It’s citrus season around here, and that means marmalade. 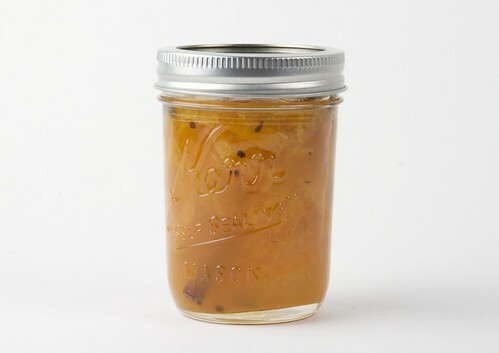 Whole cloves, cardamom seeds and cinnamon sticks decorate this sweet orange preserve and give it an aroma reminiscent of holiday desserts and spiced cider. The procedure is from our Marmalade Redux: peel the oranges and cut the peel into strips. Juice the oranges and put the strips of peel, juice and water in a pot to cook. Take the pithy pulpy parts leftover from juicing three or four of the oranges. Cut into smaller chunks and tie into several layers of cheesecloth or a cloth jelly bag (like this one) to cook in the pot with everything else. After cooking for about 20-30 minutes, the pieces of peel should be softened. Remove the pith bag and put it in the cold equivalent of a double boiler: a bowl on top of a layer of ice that’s in a larger bowl. Turn the bag over every so often to help it cool down more quickly. When it is cool enough to handle, squeeze out a few tablespoons of the cooked pulp and pith through the cloth–this will provide the pectin that will help the marmalade to gel. Put the pectin goo into the pot (which you conveniently left simmering on the stove) and add the sugar, cloves and cardamom. Stir regularly and cook to the desired consistency. To test consistency, put a spoonful on a plate in the fridge. If it’s too runny after cooling for a few minutes, keep simmering and test again after a few minutes. Put one cinnamon stick in each storage container you’ll be using and pour the finished marmalade over it. Makes about four and a half pints. If you want to can it for longer storage, Ball has a nice introduction to canning (pdf), and additional resources on their website. This entry was posted in EMSL Projects, Play with your food. Bookmark the Permalink.